In an effort to answer this question musically, my two Jam Class bands, as well as my own band, The Grand Candy, will perform a number of Hank's most famous songs in the context of some of the greatest songs of the 20th century. Stay tuned for details about the setlist! Preparing for the show, I've been reading Colin Escott's fine biography of the man. The final paradox is that Hank Williams left no journals, almost no letters, and no extended interviews, and the people who knew him best have to admit that on some level they didn't know him at all. 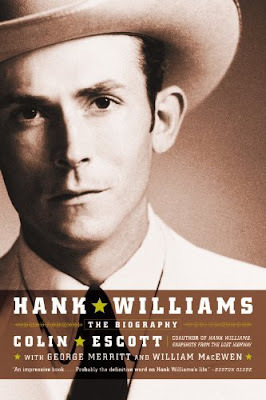 Yet, for all the ambiguity and unknowableness, Hank Williams appears almost desperately real to us through his music. He escaped the shame of seeing his drunks and dalliances splashed over the tabloids, but left a life diarized in verses sung with such riveting conviction that we feel as though we know him well. At his best, he froze a moment or a feeling in terms simple enough to register instantly yet meaningful enough to listen to forever. No one in any field of popular music can hope to do more. DC Guitar Presents "Who is Hank Williams?" Reserve a table now online or by calling the venue at (703) 534-0095.